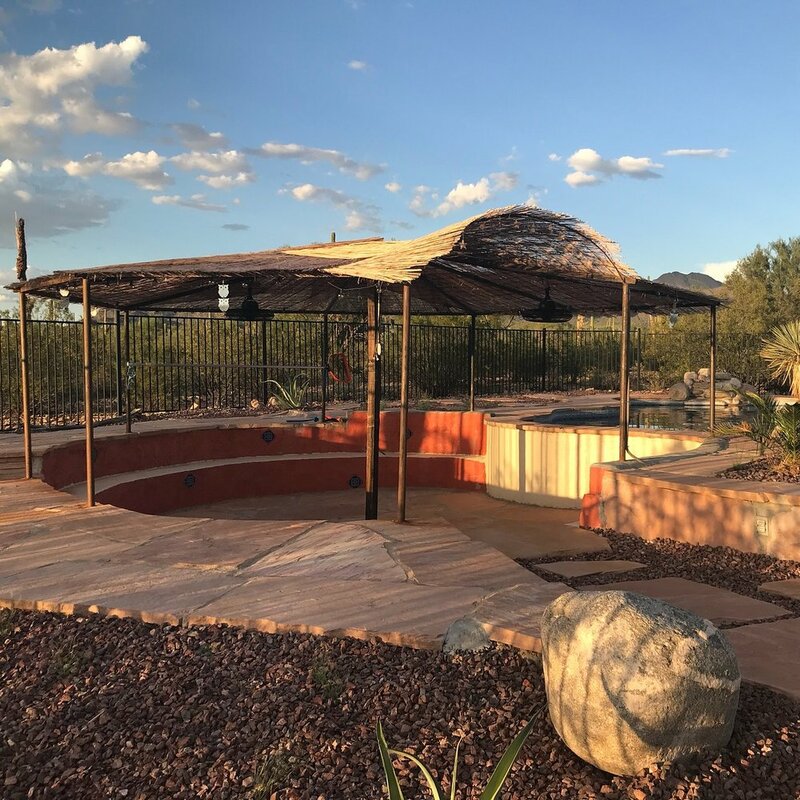 The Yoga Alchemy Sanctuary is located on 4 acres of lush Sonoran Desert in the Tucson Mountains and was founded in September 2018 by Certified Yoga Therapist Tiffany Georgia as part of her vision to create a sacred ritual and retreat space for healing and growth in the embrace of Mother Nature. At her desert sanctuary, Tiffany offers private yoga therapy, somatic/energy healing sessions, personal/professional coaching sessions, monthly full moon women’s rituals, monthly new moon yin & yoga nidra, trauma healing circles, astrology workshops & readings, crystals & chakras workshops, seasonal retreats, and many more magical offerings! One of the most unique features of The Yoga Alchemy Sanctuary is its beautiful outdoor kiva. A kiva is a chamber, built wholly or partly underground, traditionally used for sacred healing rituals and ceremony. The kiva provides a valuable framework for reflection, learning, and discussion. This sacred kiva facilitates the connection between head and heart; the connection between insight, knowledge and application; and the connection with self and with others. Whether you’re in need of a mini-retreat, emotional support, or energy clearing; wanting to establish a home practice, learn how to modify poses to work best for you, or integrate ancient tools and modern techniques to assist your healing journey; or if you’ve reached a crossroads and are seeking clarity on which direction to take next - I’m here to help. I’ve created this sacred space outside the hustle and bustle of our busy, busy, busy modern world and away from the noise of the city where you can find exactly what you’re needing and more…I’m ready when you are!